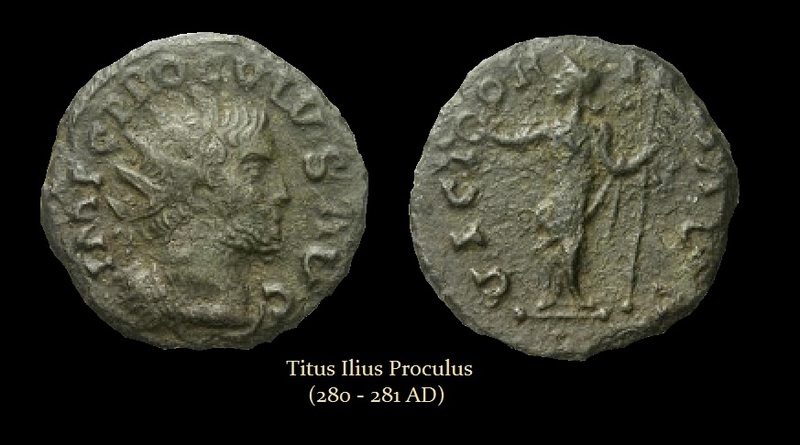 Titus Ilius Proculus was known to history only by the writer of Historia Augusta who reported that in 280 AD Proculus accepted the purple offered to him by the people of Gaul and took as colleague another usurper, the tribune Bonosus. According to some sources this took place at Colonia Agrippina, or modern day Cologne in Germany, and other sources claimed this took place at Lugdunum, or modern day Lyons in France. The emperor Probus (276-282 AD) succeeded in driving the Germans back across the River Neckar and secured the entire Rhine area by forging a pact with the existing population of the Agri Decumates who had been settled there for some time. It appears that the end of these military operations in Gaul took place around 278 AD. Probus withdrew his forces and left the region. It seems that following the withdraw of Probus from this region, the Germanic tribes once again sought to invade. Proculus was in command of the military forces defending the territories around the Rhine against the Alamanni. Probus became occupied by problems in the East and then the uprising of Saturninus in 280AD probably left Gaul feeling unprotected by Rome. 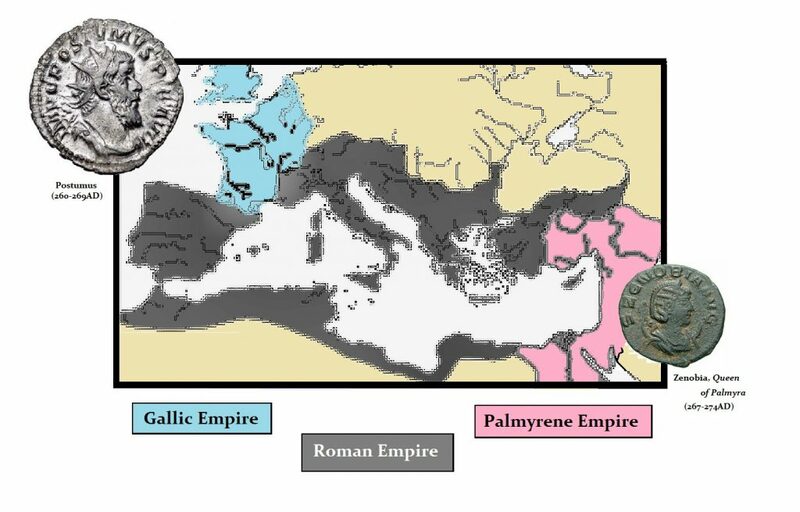 We must keep in mind that the Roman Empire had previously split with Gaul attempting to establish its own separate empire in 259AD under Postumus which lasted until 273AD when Tetricus surrender to Aurelian. Therefore, we have this new usurpation in 280AD just 7 to 8 years following the surrender of the Gallic Empire to Rome. Ironically, following the surrender of Tetricus to Aurelian, the fateful decision was to withdraw troops from Gaul expecting an invasion by the Goths. This left Gaul vulnerable to invasion once again setting the stage for the usurpation of Proculus. According to the Historia Augusta, in 275AD Aurelian had crossed the Alps to defend parts of Rhaetia (modern day Austria). The staff of the Lugdunum mint were transferred to Arelate, Arles in modern day France implying that the coinage could only have been minted in Cologne. The coinage that has surfaced confirmed the authenticity of Historia Augusta as was the case with the first discovery of two gold aurei of Saturninus in North Africa. The coinage has also confirmation the identification of the place of his elevation as being Cologne rather than Lugdunum as the most probable location. Proculus is said to have guaranteed security to the inhabitants of the province by defeating the Alamanni who were a confederation of Germanic tribes on the upper Rhine river. This information from the Historia Augusta shows how the usurpation was itself a response to the need felt by the population who were living close to the borders of the Roman Empire who were threatened by invading barbarians after the capture of Valerian I in 260AD. Here the Alamanni threatened the Romans living in Gaul and thus they looked to their own defender and not Rome. The Western provinces clearly felt the need to have an emperor always close at hand to defend them without delay from repeated and damaging invasions. The surrender of Tetricus was for his personal gain and not in the best interests of the inhabitants of Gaul. Therefore, the acclamation of Proculus as emperor can be seen as historically comprehensible and logical given the history of this region during this period. The usurpation unfolded between 280 and 281 AD. Proculus was a native of Albingaunum (modern day Albenga), where his family belonged to the local nobility. Barbarian attacks against the Rhine area and northern of Italy were a problem during the reign of Probus who managed to defeat the Goths who were an East Germanic people on the Danube and in Asia Minor. 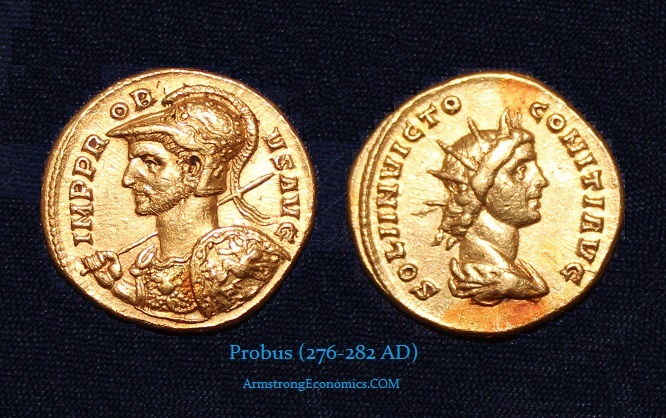 The coinage of Probus reflects the emperor most often in military dress demonstrating that he is defending the empire. When Probus marched north to confront Proculus after resolving the usurpation of Saturninus, he saw Proculus and Bonosus as clearly attempting to reestablish the Gallic Empire. Probus forced Proculus to retreat northwards, where he sought help from the Franks. The Franks instead betrayed him and handed him over to Probus. The emperor condemned Proculus to death, but the family and assets of the usurper were spared. Proculus was a native of Albingauni, situated in the Maritime Alps. He was a nobleman in his native place, but his ancestors had been brigands, and thus he was very rich in cattle and slaves and all that they had carried away. In fact, it is said that at the time when he seized the imperial power he armed two thousand slaves of his own. His wife, who drove him to this act of madness, was a masculine woman called Samso — though this name was given her in her later years, for originally she was called Vituriga. His son was Herennianus, whom also he would have dedicated to the imperial office — for that was his way of speaking — had he but completed his fifth year. The man himself, it cannot be denied, was . . . and at the same time most valiant; though accustomed also to brigandage, he yet lived his whole life in arms, for he commanded many legions as tribune and did courageous deeds. And now, since all the most trivial things are interesting and bring some pleasure when they are read, I must not fail to mention an incident of which he himself boasts in one of his letters, deeming it better to quote the letter itself rather than to speak about it at length. He boasts, as you see, of a foolish and very licentious deed, thinking that he would be held a brave man if he grew callous through repeated acts of crime. Legamen ad paginam Latinam And yet this man, who, even after his military honours conducted himself with depravity and lustfulness but, nevertheless, with courage, at the bidding of the people of Lugdunum, who seemed to have been harshly put down by Aurelian and were in the greatest fear of Probus, was called to take the imperial power. This came about through what was almost a game and a jest, as Onesimus tells, though I know that I have not found it in any other writer. 2 For when once at a banquet they were playing a game of “Brigands” and Proculus had ten times come out as “King,” a certain well-known wit cried out, “Hail, Augustus,” and bringing in a garment of purple wool he clasped it about Proculus’ shoulders and then bowed in adoration. Then fear fell upon all who had had a part in the deed, and so an attempt was then made to gain both the army and the imperial power. He was, nevertheless, of some benefit to the Gauls, for he crushed the Alamanni — who then were still called Germans — and not without illustrious glory, though he never fought save in brigand-fashion. He was forced by Probus, however, to flee to distant lands, and when he attempted to bring aid to the Franks, from whom he said he derived his origin, Probus conquered and slew him; for the Franks themselves betrayed him, whose custom it is to break faith with a laugh. His descendants40 still live at Albingauni, and they are wont to say in jest that they do not desire to be either princes or brigands. This is all that I remember having learned about Proculus that is worthy of mention. The first original specimen of a coin struck in the name of Proculus known as an Antoninianus appeared in the October 9th, 1991 public auction hosted by Bankhaus Aufhauser (lot 640, auction 8) and sold for 94,000 Deutschmarks in at Munich, Germany. The coin was discovered during the cleaning of a hoard recovered in England by the British coin dealer Richard Swan. The coin bore the clear legend IMP C PROCVLVS AVG and on the reverse the typical legend VICTORIA AVG and the personification of Victory holding in her right hand a wreath and in her left a sceptre. 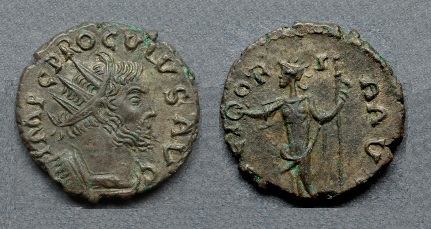 Then on November 7th, 2012, a second example of an Antoninianus of Proculus was discovered near Stamford Bridge in Yorkshire, England. They photographed the coin and posted the image on a site used by metal detector specialists. Then messages came in that they shoulod have the coin professionally valued. The coin was found to be struck from the same obverse and the reverse pair of dies. The coin was then put up for auction by Dix Noonan Webb (Dix Noonan Webb, 16 Bolton St. Piccadilly, London W1J 8BQ) of London on April 10th, 2013 as lot no. 694 (“Proculus (Usurper c. 280-281), billon Radiate, uncertain Gallic mint, IMP C PROCVLVS AVG, radiate and cuirassed bust right, rev. VICTORIA AVG. The same coin was put up for auction again in auction at Numismatik Lanz in Germany as lot 157 on December 9th, 2013 when it sold for €48,800.